The Metropolitan Opera honored the anniversary of Shakespeare’s death (four hundred and two years ago on Monday) with a revival of Bartlett Sher’s production of Gounod’s Roméo et Juliette. However, with a libretto that stunts Shakespeare’s genius dramatic structure, it was hard to see the opera as an appropriate homage. And that’s despite a capable cast and functional direction. Jules Barbier and Michel Carré’s libretto is overwritten. Where Shakespeare’s English prosody is swift and succinct, Barbier and Carré tend toward redundancy. As such, scenes in the opera stretch on and on, unnecessarily drawing out dramatic ideas. For example, when one is secretly thinking, “get it over with already,” at the prospect of a double suicide, something has gone terribly wrong. But these observations may be beside the point. Here among the living, significant effort was made to inject vitality and urgency into Shakespeare’s infamous lovers. As Juliette, Ailyn Pérez began on shaky footing, tackling “Je veux vivre” with crude coloratura and muffled tone. It sounded like the soprano had not warmed up enough, as if she were muscling her way through the more demanding passages. But as the first act continued, she got into the groove and figured things out; by the time she reached the Poison Aria, “Amour ranime mon courage,” she was delivering a rich, full-throttled performance. 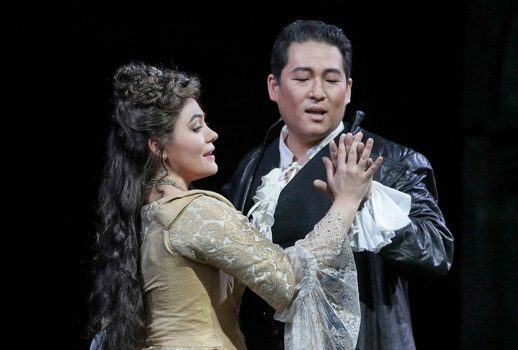 As Roméo, Andrea Shin stepped in, replacing Charles Castronovo. Considering the last-minute context, his performance was exceptional, with a clear, ringing tenor, redolent with youthful hubris and ardor. Understandably, his Roméo was not as complex or evolved as it might have been under better circumstances—if he seemed a bit dead behind the eyes, who could blame him? Perhaps he was sublimating all his concentration into an expertly produced sound? Playing the grown up in the room, Frère Laurent, Kwangchul Youn’s steady, sobering presence brought balance and contrast to the fizzy, erratic energy of the other, more youthful characters. If there was a weak link among the living, it was Plácido Domingo’s conducting, which reduced the score’s urgency to the lethargy of a jellyfish. The tenor (or baritone, or whatever he is…) recently finished a run of Verdi’s Luisa Miller at the house. One wishes he had chosen to focus on either that or his conducting in Roméo; instead, he turned in equally mediocre work in both. Bartlett Sher’s production, while efficient, and not without a few elegant touches, still lacked a particular point of view. When I first reviewed it in 2016, I found the direction to be workable and concise. But after Monday night’s season premiere, I’m starting to revise my previous opinion: it wasn’t very interesting, nor did it deepen or complicate the familiar story. It lacked creativity. Also (and I know this is nit-picking) Juliet’s excessive trains, while beautiful, frequently snagged on various parts of the set. When this happened at the premiere, I assumed the company would iron out these awkward wrinkles. But the most recent performance proved that they have not, and poor Ms. Pérez ran into the same problem over and over again. However, I think my largest issue with Roméo et Juliette is not with its cast or direction, but with the aforementioned libretto. Gounod’s score is often beautiful and dramatically potent. If there is any access to the characters’ interiority in the opera, it’s through the music the composer has supplied. While there is a history of intervention on Shakespeare’s text, I find such amendments (for example, a happy ending) to be rather bogus at best, and willfully ignorant at worst. And I have to say the same is true for Jules Barbier and Michel Carré’s additions. A comparison between the play and the opera reveals genius in the former, and lazy excess in the latter. I’m not suggesting we abandon Gounod’s adaptation all together. The opera provides a few excellent set pieces for its singers, especially the soprano. But when criticizing a particular performance, I think it’s important to keep in my mind that some deficiencies are unavoidable. A cast and director can only do so much with middling writing. The best one can do is try and see past the blemishes and savor what the living artists have to offer. In any event, here’s hoping for some better way of honoring the bawdy bard—perhaps something on the anniversary of his christening, April 26?